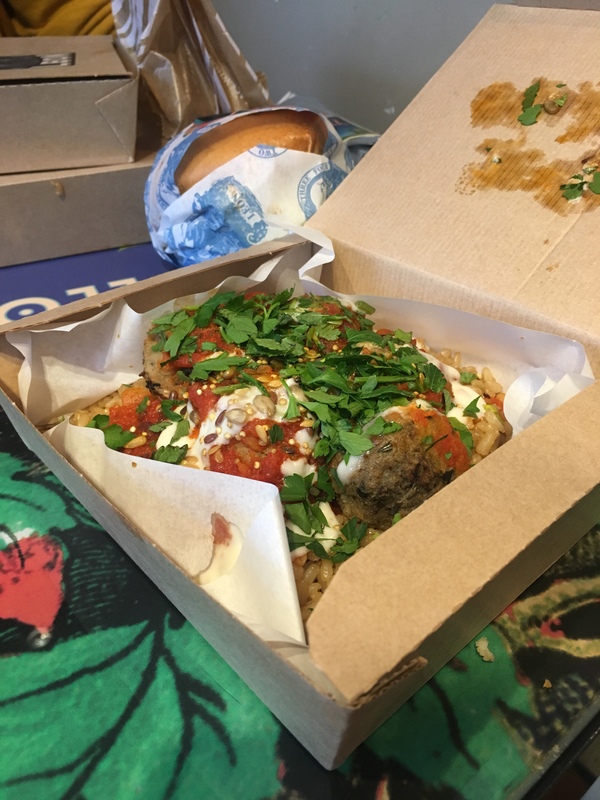 It seems almost impossible that I haven’t reviewed Leon yet, as it’s been a staple grab and go lunch option for us ever since it opened in Oxford. 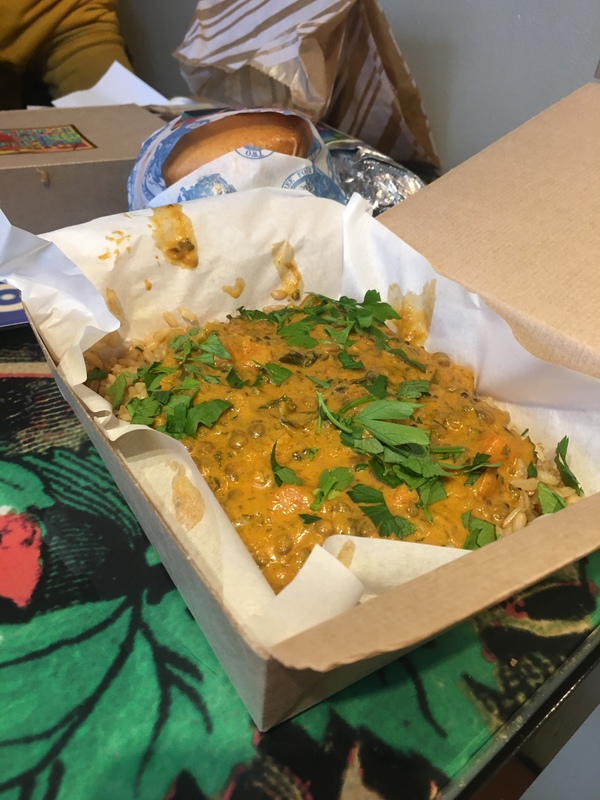 However, in the name of Veganuary and enticed by some of the newer options I had yet to try, we headed back there to try it out. On a Saturday lunchtime, the queue was pretty long, but the staff were obviously well practised at churning out the orders as we’d got to the front of the queue almost before deciding exactly what we wanted. They got our whole order correct (which I have to say doesn’t always happen when I go here) and the food came out hot so perhaps it’s actually better to visit Leon at peak periods. We were out all day so what we ordered was effectively our lunch and dinner (and even breakfast for Jamie, who hadn’t eaten anything else). We started off by sharing the new Love Burger, a beetroot soy patty topped with burger sauce, tomato, pickle, and Follow Your Heart cheese. 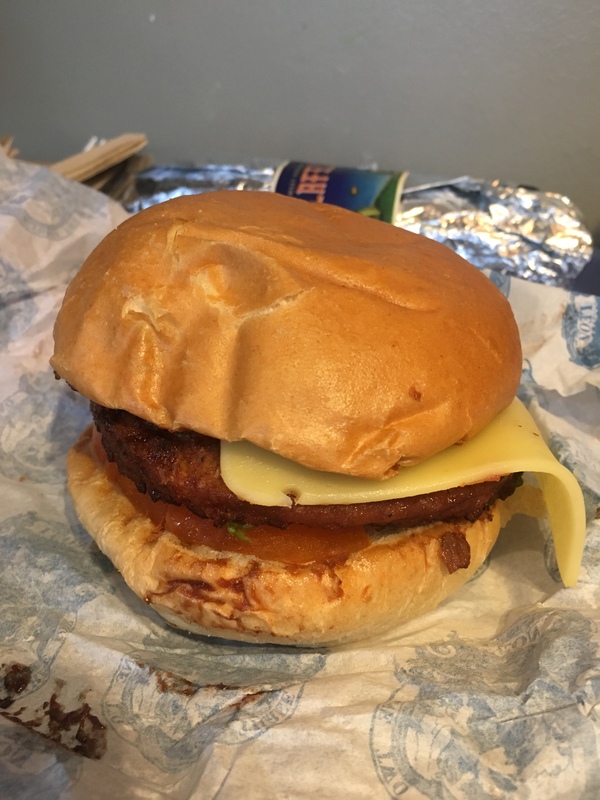 I love the fact that you can walk into a fast food place on the high street and grab a vegan cheeseburger which really delivers what you want from that type of food! It was smoky thanks to the cheese, with a hint of garlic from the sauce, and the texture was great. The only downside was the cost, as if you want to make this a meal with fries you’re looking at around £9, which while still fairly reasonable for a whole filling meal, doesn’t really compare to other fast food price points. The other hot boxes on offer at Leon seem comparatively better value. Still, I’d choose this burger over McDonalds’ offering any day. Next, we tried the lentil masala, a creamy coconut curry. It was sweet with only a hint of spice from cumin, ginger & mustard seeds. A handful of parsley on the top added a freshness to lift things up. There was a bit of carrot mixed in but the dish really was mostly just lentils. We felt, as with all of the rice boxes, that the sauce to rice ratio was a little off (maybe that’s personal preference?) and it could’ve done with a bit more curry sauce. This would probably drive up the calorie count considerably though so perhaps that’s a factor when their key offering is healthy fast food. Always a favourite of mine, we had to order the meatless meatballs, which are made with aubergine and olives. I really don’t like olives on their own but here it is quite mild but brings umami flavour to the dish. The balls were quite soft and didn’t have quite the same texture as your meaty counterpart but it’s enjoyable in its own right. The tomato sauce over the top was punchy and fresh, then you do get some texture to the dish from the crunchy seeds on top. The garlic aioli really makes this dish and it’s so tasty when everything is mixed all in together. Also, I don’t know how Leon cook their brown rice but I really do love it! 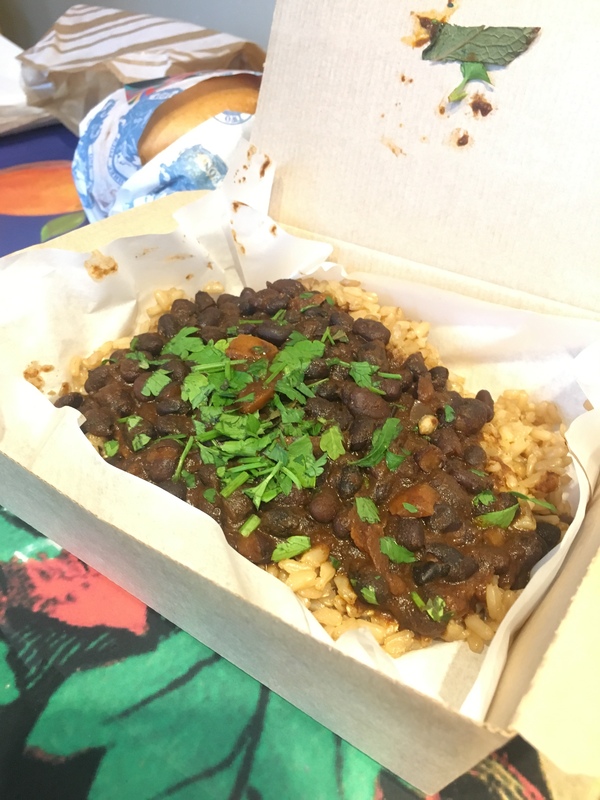 The last rice box we ordered was the Brazillian black bean, a stew which used to be my go-to until the meatless meatballs arrived on the scene. It was full of smoked paprika, with a pinch of chilli, and was a really hearty warming meal for a cold wintery day. There’s a little bit of carrot mixed in, but like with the lentil masala, there isn’t much going on in the way of vegetables. So yes, essentially it is just rice and beans, fairly simple and taste and certainly simple in presentation (you’ll see from all of the photos that that’s clearly not a priority here), but that’s reflected in the price. I’d much rather go for this than a meal deal. 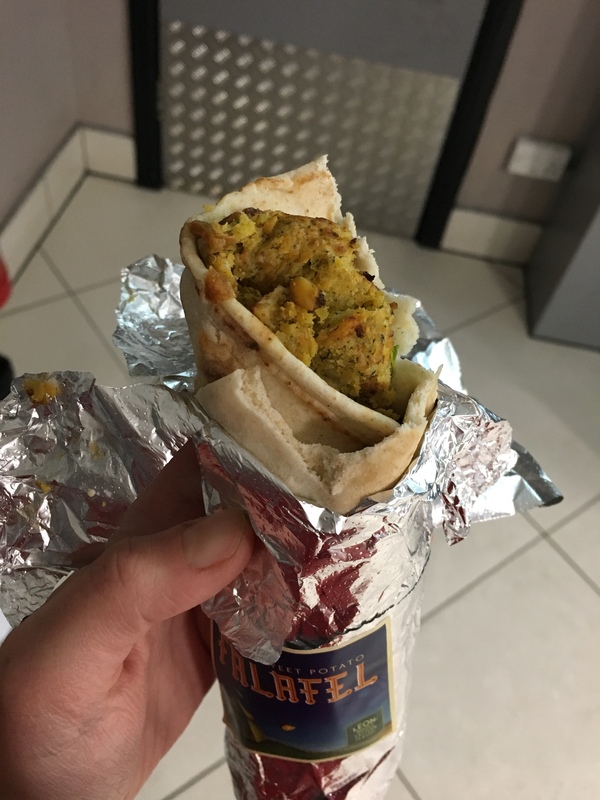 We picked up a falafel wrap to snack on later, filled with sweet potato falafel, aioli, harissa and crunchy veg. The falafel, although it tasted nice, was a bit too soft so the only texture in the wrap came from the salad – of which there was probably more of than the rest of the filling Lets face it, falafel wraps are one of the things vegans can find in abundance at supermarkets, cafes and the like, and this one wasn’t so much more amazing to me that I’d buy it over a refrigerated one from Tesco, especially when there are so many other tasty, cheap options to be had at Leon. As with the burger, this meal might have been improved with a portion of lattice fries, but that would bring the cost up even more. With so many other options at the restaurant, I don’t think I’d ever choose to order this. Lastly, I just had to try the vegan jaffa cake, as I used to eat multipacks of the things in one sitting before I went vegan. The orange jelly was zingy and exactly how I remembered the original to be, though not quite the same in texture. The vanilla of the sponge came through quite strongly because of the amount of cake, and again the texture wasn’t quite the same spongey base. While they look very cute in this mini bundt shape, the cake-jelly-chocolate ratio wasn’t really the same. The rich dark chocolate on top though was just right. The crystalised orange gems on top were also a nice touch. This cake honestly did really fill the void that Jaffa cakes once did, and I thoroughly enjoyed eating it, but sadly as with all the sweet treats at Leon, I probably wouldn’t buy it again because of the price. I’ve tried the chocolate chai and rose pistachio Ruby’s doughnuts before and the experience was exactly the same, while they were delicious they are fairly small and not quite worth the price tag. 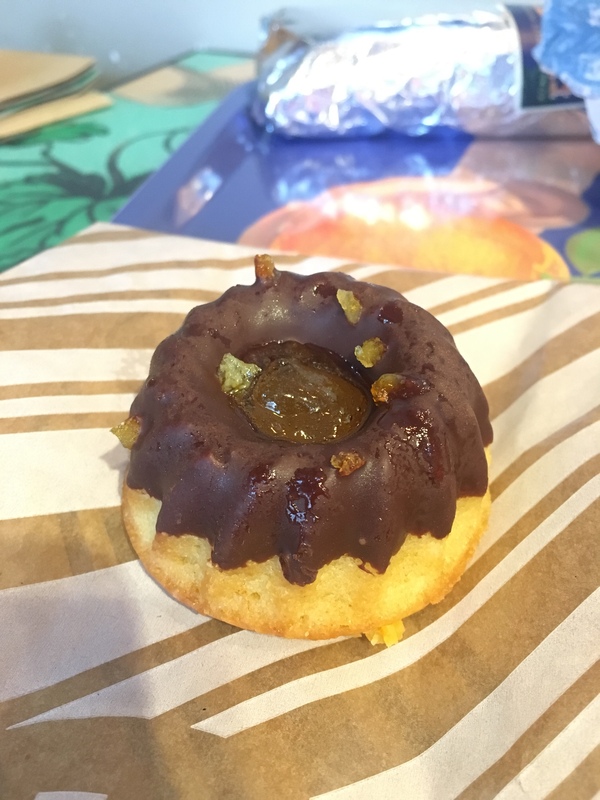 I’d be keen to try recreating the jaffa cake at home as I think it wouldn’t be too difficult to do. As I mentioned before, I am a Leon repeat customer, and there’s a reason for it. I love that they have so many vegan options on the menu, the food is wholesome and reasonably priced. Leon offers a generous 15% student discount, so everything we ordered only came to around £22. While it is fast food and the service is what you’d expect, the general atmosphere in the restaurant is much nicer than the big fast food brands; as a student, I’d happily spend a couple of hours here working over lunch and a coffee. Where is your favourite place to get a quick, chilled out lunch in town? I’d love to hear your recommendations in the comments!